You missed (or hit) on the fact that no one mentioned O-ring binders. Almost everyone collecting cards and posting on this site already knows D-ring-only for cards. That's where the sheet-lifters come into play. We aren't concerned about cards hitting the ring in the middle of the album/binder. It's the bottom of the ring that you have to protect against. I store all of my binders flat on their bottoms, but I make sure there is something under the last pages to keep them from crimping against the rings. The only O-rings I will use for cards are small (1 inch or less) as temporary storage until they get placed in a larger binder, but I still use something to keep the pages off the bottom of the rings. I'm glad you made note of it, but the OP stated he has Ultra-Pro binders and those have always been D-ring binders (to my knowledge). I still have several of them from the early 90's and all are D-rings. I'm pretty sure that card collecting and medical records were the driving force behind most binders/albums/notebooks switching from O-ring to D-ring over 30 years ago. Most of the O-ring notebooks now are small and for students who will toss all that paperwork in the trash when they complete that grade or class in school. And the D-ring has evolved now into the slanted-D that allows even more pages to be added and more protection for everything contained within the rings. The slanted-D keeps more outer cards away from the outside edge of the binder now. Back to the OP: if the pages top over the underside of the curl in the D-ring, you've added too many pages and need to remove some. You don't want your pages or the sheet-lifter to hit that left-turn into the other side of the ring. I appreciate everyone's replies concerning my question about how many pages is enough for a binder. I did mention I had the Ultra-Pro binders but didn't mention the ring style. It is a D-ring based on research I did before purchasing. The main reason I decided to do binders for most of my cards, which don't include rookies, autos, and memorabilia, was to have a better way to look at them. When in a box it takes a lot to grab them and sift through to find a particular one. I'm also putting them in chronological order by year, brand and card #. I am definitely going to pick up some page lifters. The hanging binders come in all sizes, large ones are a bit pricey. I made my own large hangers out of hanging folders and a dowel. Just slip them in. Smaller binders do work better, D over O, but if they are free, I won't turn them down. .... like Medical Offices. Of course you then need a hanging binder cart [previously pictured] preferably rolling. Binders standing up over time bend and curl, need lifters. Binders laying down, beware of impressions and pages sticking together. As far as viewing cards, I separate value cards from set boxes anyway and binder them for viewing. Nice array. That way you can see them, Stars and RCs and ERR/VARs are the only thing you would look at anyway, nobody is looking at a common card of a player that didn't make it? I'm in the process of making the switch to archival binders with angled D-rings. Angled D-rings eliminate the need for page lifters. The angled D-ring keeps the bottom pages away from the metal spline. Archival binders are more expensive but at this point in my collecting career I feel they are worth the investment. As far as pages, I only use Ultra-Pro Platinum. BCW makes some great pages as well, but I like the feel of the Ultra-Pro pages better. If I was to spend money on something, I would spend it on quality pages first and then upgrade binders at a later date. Although crappy binders are....well, crappy. Chad, just for the record, I have physically seen pages slide under the slanted D. Sheet lifters cost less than a star card in just about any set. The only time I ever had issues with cards in a binder was because of a sheet lifter. The inside cards of the bottom two pages developed a slight bow caused by the sheet lifter. This happened during a move when I had all my binders stored flat. I now realize that it was because I was using a "bowed" sheet lifter (like the 3rd form the left) and not one of the flat ones. However, I specificaly chose to use binders that have the ring bracket mounted on the back cover vs the on the spline to avoid the potential of sheets sliding under the D-ring. With the binder bracket on the back cover, the bottom of the ring stays flush with the back cover even when opening the binder. I probably didn't explain that very well. However your point is noted, as cheap as page lifters are it probably wouldn't hurt to throw a good flat one in there just to be on the safe side. Edit...My apologies to the OP for digressing from the original topic. I happen to be in the midst of storage upgrades so binders and other storage products are in my daily thoughts. Suprisingly, my wife has no interest in hearing about my binder selection thought process. For card collecting: it doesn't matter what ring you use or where they are mounted, you NEED sheet lifters (or something else) at the back of the binder (and always flat lifters). Spine-mounted rings are the worst you can get for cards. I always get binders/albums/notebooks with back-mounted rings. And the "angled-D-ring" still needs a sheet lifter too. I called them "slanted-D-ring" earlier, but it's the same thing. Cards and pages (even combined) are still thin enough to slide under the bottom of any ring in any style of binder. Something needs to be behind the cards to stop the last page from sliding under the edge of the rings themselves. 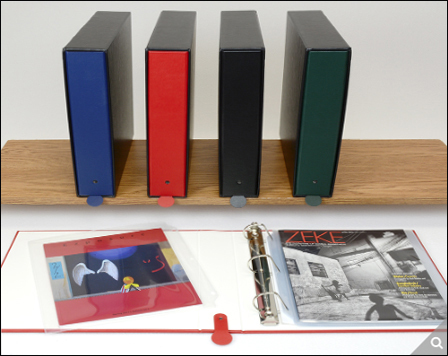 Those curved sheet lifters are meant for the top of the ring to keep the binder from contacting the contents and should always curve upwards into the binder-front. They are not good for storing cards though. Under any pressure (horizontal or vertical), they will make an impression in the cards over time. While we are talking about supplies I have a question about which 9 pocket sleeves are better for the cards. When I started back in the 90's Ultra Pro were the first to come out with the better sleeves. Is there a difference between any of the companies making the sleeves today? I am just getting back into collecting some newer stuff and finishing what I started way back when. Let's clarify some terminology, and then we'll talk about the actual supplies. A sleeve is an item that can hold a single card. An item with 9 pockets would be a page. I have used several brands of both, and I will attempt to use UltraPro Platinum pages exclusively at this point. In some instances, UltraPro does not make certain sizes that BCW does, so I will use BCW for the oddball sizes. Sorry about the terminology mistake and thank you for the clarification. Yes I was talking about the pages and not sleeves.